A few hours ago I was playing a computer game when I noticed smoke coming from next to my laptop. Then I noticed that the stack of paper next to it had begon to smolder. I threw it into a glass of water and moved it away when I noticed how increadible hot my laptop was now running (heat rising through the keyboard but especially out of the back through the air holes). I decided to run a temperature monitoring program that showed that 3 of the cores where at 120/130 degrees Celsius and the fourth was at 76. This is on a EliteBook8570. Is this safe? Is there some way to limit the max temperature (preferably without randomly shutting down my laptop as it now sometimes does). It has always ran hot but recently more so than usual (it's now summer). Note that is shows this behaviour both in Ubuntu and windows 7. It appears that for now putting a metal bar under it so that air can better come to it helps reduce the temperature down to a mere 90 degrees. Still that's quite a bit warmer then I would like. And yes I do regulary try to clean the dust out (I have heard this laptop model has more heat problems). Usually most CPU's are designed to shut down at 90 degrees to save CPU from being damaged. This temperature is called Tmax, Tcase, Tjunction. 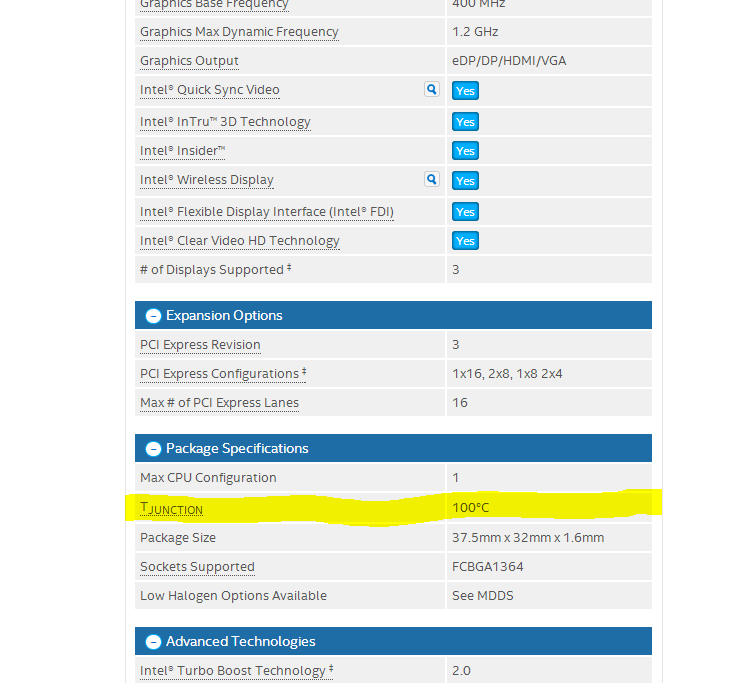 You can find your CPU's Tjunction at http://ark.intel.com/ by selecting your CPU model. Now that your CPU has somehow already broken that barrier, there is good chance it has lost it's efficiency and I highly recommend you to replace it. Also while doing that, clean the heat sink or get a new one and have the CPU re-pasted with new thermal paste(very important). Also try to use a laptop in a non dusty, cool environment on a flat well ventilated place. I would also highly recommend you to invest in a cooling pad while playing games(buy one, which can be opened up and cleaned easily as it also accumulates lot of dust). Try uninstalling unnecessary software for the time being and look for suspicious process in the windows task manager and see which ones are using the CPU maximum. After doing that see that the problem persists. Hope it helped! Happy cool gaming. EDIT: Are you cleaning the dust out by taking out the heat sink? if yes, then you should clean out the old thermal paste carefully, and the apply a complete new layer before re-attaching the heat sink. Here is a link if you want to do it yourself,http://www.maximumpc.com/article/howtos/howto_install_cpu_and_apply_thermal_paste Nowadays, there a thermal pads for CPU's, so you can just buy them instead of thermal paste. You have a heat problem. Probably a build up of dust on and around the CPU and cooling components or the thermal paste is drying up and not fully transferring the heat to the cooling components. Possibly both! Use some compressed air through the fan exhaust/vent, take it apart to clean or take it to be professionally repaired. Failing the heat problem you may have a CPU on its way out. Yes, your laptop is overheating. Intel's Tjunction for a mobile Ivy Bridge is 105 C.
Use compressed air to clean out the vents. On your EliteBook 8570w, these are located on the left side, the bottom left (right when upside down). Then check the temperatures again. Not the answer you're looking for? Browse other questions tagged laptop cpu cooling temperature or ask your own question. Where does most of the laptop heat come from? Can high tempretures damage my laptop CPU or fan? Laptop air flow is too weak on heavy CPU load (3D gaming)? Do I need a second (non-CPU) fan in my system?